A Google search and a flip through a few pages concerning Queen Victoria led me to a discovery I otherwise wouldn’t have had the awareness to connect on my own. Victoria & Abdul – a harmlessly twee and often painfully self-conscious movie – serves as the obvious remake / pseudo-sequel to John Madden’s ’97 feature Mrs Brown. It’s impossible to not notice their identical storylines, especially when the same Dame Judi Dench plays the Queen in both films. Seriously, please take a few minutes and watch both trailers back-to-back (click here for Mrs Brown, scroll below for this movie); it basically borders on copyright infringement. Victoria & Abdul glows with charm in its first half and succumbs to treason in the remainder, mostly because this biopic can’t decide what it wants to be. A comedy? A retreaded drama? A source of historical information? It throws all three of these darts at once and none come close to the bullseye. 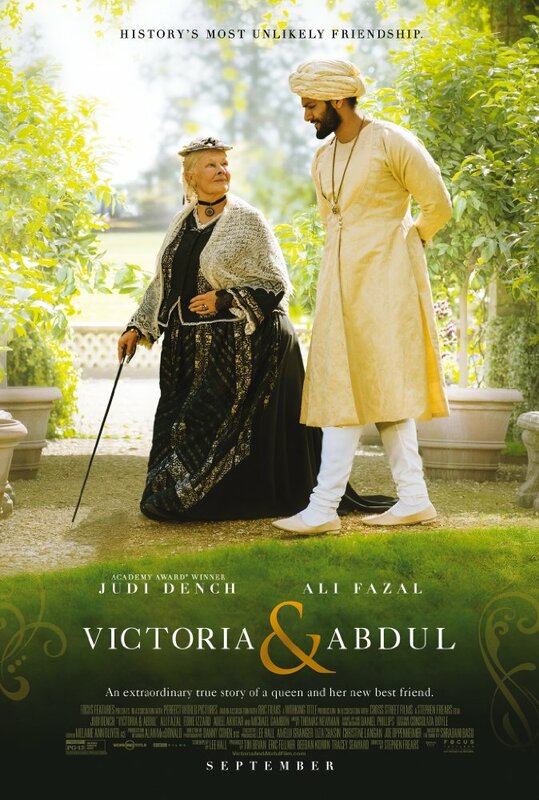 Victoria (Judi Dench) is well past the golden years of old age, shuffling along in a rigidly scheduled and pre-planned existence, feasting and sleeping through banquet hall dinners with nary a consideration for the countless guests. Her Majesty is a curmudgeonly woman, unanimously feared by those who come her way. But then she has a change of heart when Abdul (Ali Fazal) – a lowly yet incredibly bright man from India shipped over to present the Queen with a ceremonial coin – dares to look the English Medusa in the eye, evening chancing a slight smile. Because Dench is a masterful actress, the nuances in her wrinkled cheeks and the youth in her eyes transition from stale boredom to a timid excitement. We can see a friendship spark its first match. The relationship really is like that of a surly cat tempted by the devotion of a dog. The Queen wants to be alone and Abdul wants to be of service to his Empress. As expected, the handsome dog’s persistence wins out. Victoria & Abdul has familiar yet still impactful themes in this honeymoon phase of their friendship. It advocates for higher education and a longing to never stop learning, recognizes the importance of being cultured, and quite appropriately gives the upper hand to those who display a blend of honesty and loyalty. And then, just when you’ve cozied up to this warmhearted story, the blazing charisma is hosed down and thoroughly extinguished. Victoria has to defend her sanity, the workers all threaten rebellion because of Abdul’s rapid rise through the ranks, the airiness of the picture becomes dark and bogged by cruelty. This film is a two person enterprise as the title suggests, which makes Abdul’s missing presence in much of the second half all the more dispiriting. The farther he’s gotten into his career, the more director Stephen Frears has allowed himself to get in his own way by conforming to a certain style and brand. Gone are the days of the challenge and eccentricity he brought to pictures like Dirty Pretty Things and High Fidelity, now morphed into the plucky schlock of Philomena and the abominable awards fodder Florence Foster Jenkins. 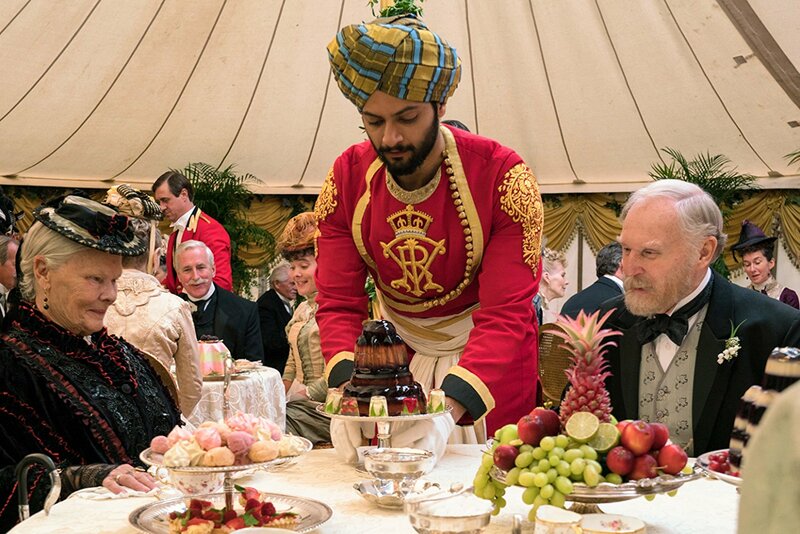 Victoria & Abdul is just another entry in his comfortable catalog that will impress many viewers – for what it’s worth, the costuming and the scenery are extravagantly captured – without having the energy to impart insight. Like a Nancy Meyers film aimed at moonstruck moviegoers or a Minions flick targeting easily pleased children, Victoria & Abdul will effortlessly click with audiences in search of some undemanding goodness. I’m not saying that’s a bad thing either, but simply that this one wasn’t for me, mainly because it lacked the human detail to elevate the personal emptiness to the lofty level of its ornate design. Ouch! This review isn’t what I anticipated. But, at my ancient age some undemanding goodness ain’t all bad.